During C-Suite Conversations, a distinguished guest sits through an unscripted interview on-stage in Ukrop Auditorium. Dr. Richard Coughlan helps guide the conversation, and students, faculty, fellow business leaders and other guests are given a chance to join in the discussion. Follow us at @UR_RobinsSchool and be part of the conversation: #RobinsSpeakers. Presented by the Robins School of Business; supported by PNC Bank and ChamberRVA. Tom Farrell, CEO of Dominion Energy spoke to our students about the energy company's history in Richmond and how they are revolutionizing their grid across the region. Neil Amin, chief executive officer of Shamin Hotels, spoke with Dr. Richard Coughlan about the company’s many holdings in Virginia, and across the country, and about his rise through the hotel industry. 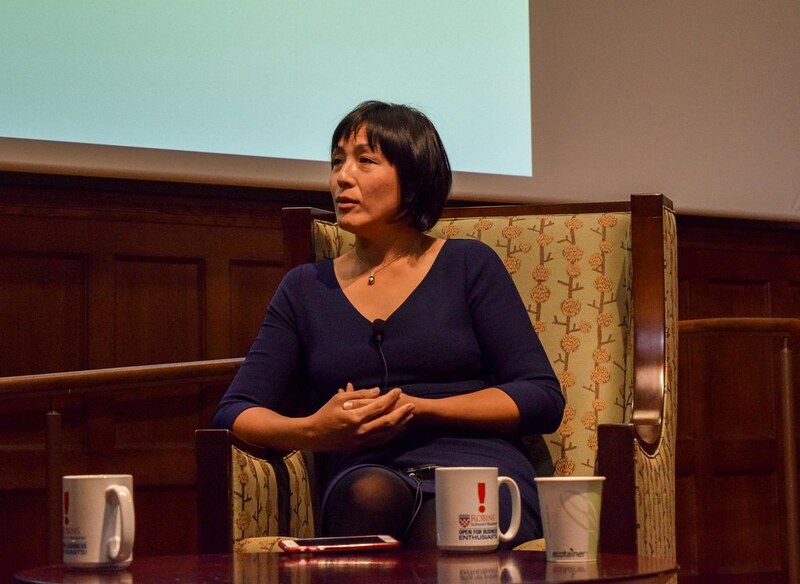 Courtney Paulk, L’00, joined Dr. Richard Coughlan for a C-Suite Conversation on February 12, 2019, to discuss her career path from her time at the University of Richmond School of Law to becoming president of Hirschler, a Richmond based law firm. Thomas Joyce, President and Chief Executive Officer of Danaher Corporation, speaks of the lessons learned while building a global, multi-industry portfolio of businesses for the science and technology organization. Richard Wintsch, executive director at Startup Virginia, sits down with Richard Coughlan to discuss the startup incubator's growth and success and Richmond's thriving entrepreneurial scene. Dan Schmitt, president and chief operating officer of HHHunt joined Dr. Richard Coughlan for the first C-Suite Conversation of the 2018-2019 season. They discussed how he has revolutionized the company’s strategy since becoming COO in 2013. Denise Johnson, group president, Caterpillar, Inc., joined Dr. Richard Coughlan for the final C-Suite Conversation of the 2017-2018 school year. She discussed the company’s commitment to its customers during a sales downturn, and how her sector has come back stronger as a result. Tim Bezbatchenko, ’04, general manager of Toronto Football Club, joined Dr. Richard Coughlan for the first C-Suite Conversation of 2018. They discussed Bezbatchenko’s career from his time on the Richmond Spider soccer team through his work now in Toronto. Bill Rogers, SunTrust Banks, Inc.
Bill Rogers, CEO, SunTrust Banks Inc., discussed the company’s values and initiatives with Dr. Richard Coughlan in the second C-Suite Conversation of the year. Beto Guajardo, Senior Vice President of Global Strategy for Starbucks, spoke with Dr. Richard Coughlan about how he creates the Starbucks experience, and what the company is doing with new technology to tailor that experience to every individual customer. Macy’s CFO, Karen Hoguet, discussed the changing landscape of retail shopping in the final C-Suite Conversation of the year. Ron Carey, president, Studio Squared, shared insights on his career in digital marketing for companies like Starbucks and Walmart with Dr. Richard Coughlan in the second to last C-Suite Conversation of 2016-2017. Shane Emmett, CEO of RVA based superfood company Health Warrior, shared his experience in starting his own business, and getting an early entry into the superfood industry. 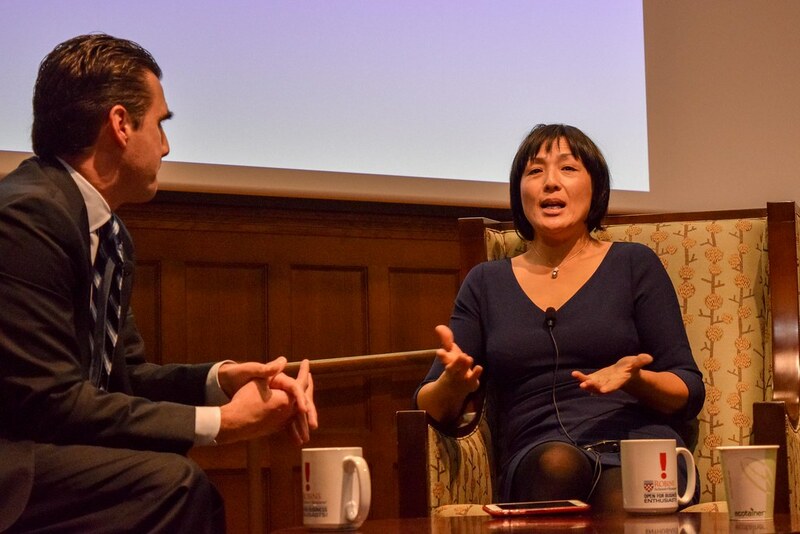 The Robins School of Business welcomed Ting Xu, founder of Evergreen Enterprises for a C-Suite Conversation with Dr. Richard Coughlan. She shared her family’s immigration story, and explained how a career for her retired parents making decorative flags in her garage turned into a major company. Kevin McQueen, Captech Ventures, Inc.
Kevin McQueen, chief executive officer for Captech Ventures, Inc. joined Dr. Richard Coughlan for an unscripted, hour-long discussion on leadership, decision-making, strategy, and other areas that contribute to the organization’s success. Melanie Healey, retired Group President and Advisor to the Chairman and Chief Executive at Procter & Gamble, speaks as part of the C-Suite Conversations at the Robins School of Business. Kevin Chidwick, CEO of Elephant Auto Insurance, speaks as part of the C-Suite Conversations at the Robins School of Business. 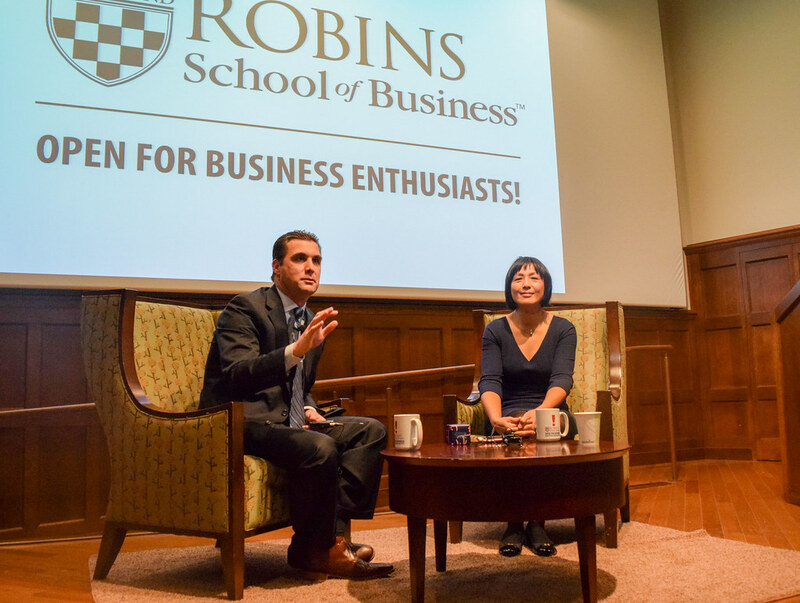 Matt Williams, CEO of The Martin Agency, speaks as part of the C-Suite Conversations at the Robins School of Business. Mat Dellorso, '09, and Fred Bryant, '10, co-founders and presidents of WealthForge, speak as part of the C-Suite Conversations at the Robins School of Business. Paul Trible, co-founder and CEO of Ledbury, speaks as part of the C-Suite Conversations at the Robins School of Business. C-Suite Conversations are free and open to the public, but registration is required. Each event includes a networking breakfast at 7:30 a.m., followed by the program at 8:00 a.m.